Happy adventures and Happy Birthday Jenny! Was the steak your birthday dinner or is there another Airstream special in the making? Lamb will be our main course this evening and then a bonfire in the fire pit. One thing that might help Dakota is time at a Dog park…I am sure you are in St Augustine by now but a lovely dog park outside of Jacksonville was an awesome rest stop on a recent trip to Florida with two new puppies and need for doggies socialization…just a road warrior with dogs tip that might bring a much needed respite to the “human” elements of teaching old dogs, that stay home alone without other dogs, new tricks…type into google maps, dog parks near me and you will be surprised of the free experiences available!!! Happy Trails and Puppy Dog Tails! my condo is just north of St. Augustine, FL in Ponte Vedra Beach. unfortunately, I won’t be there until April or we could have had a meet up. St. Augustine is lovely, but beware, the streets are as narrow if not more so than Savannah! We found out about those narrow streets. Have a great Birthday dinner. We have been reading about the springs and it looks like a fabulous place to be. Enjoy! You make a great argument for map reading, something I still love to do. Happy Birthday. Skidaway is indeed stunning. I had the opportunity of staying on the island as a teen at the research center there. Happy Birthday fellow Aquarius – mine was last week…. This is so fun to make this adventure with you – I loved St Augustine and just imagine how seasoned Jim is going to be a few weeks in – and especially down the road! I stumbled upon your blog post!! 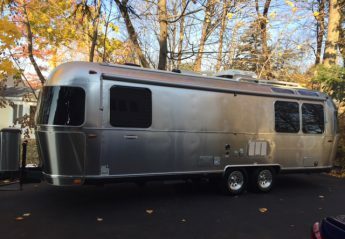 Love the Airstream photos and your adventures down south! So great to see you both for our birthdays. Jim is doing a fantastic job keeping the machinations of lifestreaming running smoothly, especially on this maiden voyage. Obstacles have presented themselves but Jim has shown a steely resolve to figure out solutions. Jenny, you cook a mean Airstream meal. I loved every bite. Wheels up, Lifestreamers! Who knows what’s around that next bend in the road!